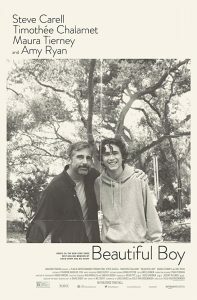 Based on the memoirs of father and son David and Nic Sheff, Beautiful Boy tells the story of drug addiction and its effect on a family over several years. By the end of this powerful drama you do feel that families who are dealing with an addict have in fact been mourning for the potential loss of a beloved. Timothee Chalamet turns in a nuanced performance just a year after his debut in ‘Call Me By Your Name’ (2017) as sensitive soul Nic Sheff who struggles with addiction to hard drugs. Music is front and centre in this film, and it serves to help music journalist David (Steve Carrell, Foxcatcher) remember episodes from Nic’s youth and upbringing with him as a devoted father who does his best to offer an idyllic family life and good upbringing. David is searching for some sort of understanding of why and where the spectre of drug addiction could have found its way into the family after Nic expressed a desire to ‘escape boring reality’ through drugs. The narrative bounces from present day efforts by David, his ex-wife (and Nic’s mother) and his new wife and family to support and rehabilitate Nic back to snatched moments in Nic’s youth. The strain eventually brings each of them to breaking point in parallel with the realisation that David won’t find the answers he’s seeking in one solitary moment in the past. Mixed in with some of the more harrowing moments are those snatched daydreams from Nic as a youngster at a variety of ages where his youthful exchanges with his father feel idealised in the kind of golden light that bathes David’s plush California house at times in the film. Steve Carell works well in another serious role as father David but he is overshadowed by Chalamet’s excellent performance and the heavy handed and occasionally intrusive music choices from David Bowie and Massive Attack to John Lennon to underscore certain moments in the film. Almost as heavy handed as the discovery of a notebook which details Nic’s thoughts and feelings like a sketched out internal monologue halfway through the film. The strong relationship between father and son sadly sidelines the women in the film, from Nic’s mother and step-mother to Nic’s girlfriend, who all have their roles in the drama but feel sadly underdeveloped. And the stylised editing tropes feel like a slow burn all the way up to a dramatic denouement which deals with the move from denial and anger over the situation to grief a little unevenly despite the comparison of idyllic family life and the grotty life of the crystal meth addict. And, like one moving speech from the film, it’s grief over the effective loss of a loved one that hurts over the years, even if many families may live in dread of receiving the call that ends their torment in a most cruel way. Summary: BEAUTIFUL BOY is a US biographical drama in which a father helps his troubled son overcome his addiction to methamphetamines. This entry was posted in Shooting The Breeze and tagged Beautiful Boy, film review, Steve Carell, Timothee Chalamet. Bookmark the permalink.